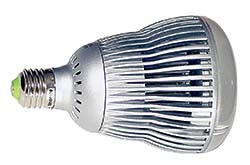 The LumaPro® LED reflector lamp replaces a 65-watt halogen and helps reduce energy consumption. The unit is designed for use in standard screw sockets in interior spot and floodlighting applications. It is fully dimmable and emits a warm light. It features 575 lumens and a color temperature of 2,700 degrees Kelvin, and it has an average life of 50,000 hours. The beam angle is 105 degrees.